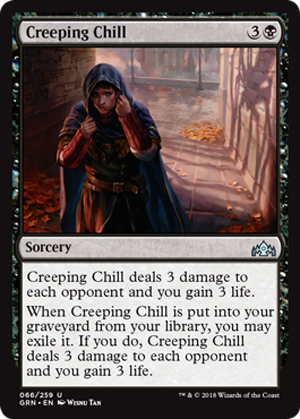 Creeping Chill is a card designed to interact with the surveil mechanic, much like Narcomoeba. With enough surveil cards in your deck, you’ll be digging into the top cards quite regularly and have a pretty good chance of a little extra incremental advantage on top of the usual incremental advantage from those cards. But it does have elements that put it into consideration for uses beyond the obvious. Putting one or two cards from your library into your graveyard at a time is effective with it, but putting half or more of your library into your graveyard is even more so. Traumatize, Golgari Grave-Troll, or Morality Shift decks become even more dangerous when they don’t have to attack or even target their opponent to win the game. On top of that, it has a very multiplayer-friendly “each opponent” clause, which makes casting it for its real cost the right play at some times. A bad Lightning Helix variant you can only aim at an opponent…at first glance. The triggered ability on this is magnitudes scarier, to say the least. While it self-exiles to make sure it’s not too degenerate, that you can use surveil, dredge, or other mechanics that automatically put this into the graveyard from your deck makes this very usable, as zero mana for a Lightning Helix is a lot better. This card is one that’s likely to only go in decks that want to do things of dubious levels of fairness, and it gets exponentially better if you have pieces to enable the free cast of it. This very much is a card you are not going to want to draw, but the idea of blasting an opponent for 12 damage (and gaining 12 life) with the right build gives this some legs.